The baroque market square, surrounded by arcades and festively decorated booths, has a distinctively warm golden glow during its glorious Christmas Market. Entrance arches and gates are made out of thousands of tiny light bulbs, welcoming visitors to over 170 Christmas booths. Throughout the market square, majestic angels spread their glittering wings to bless the scene. The two beautiful baroque churches are also festively illuminated. 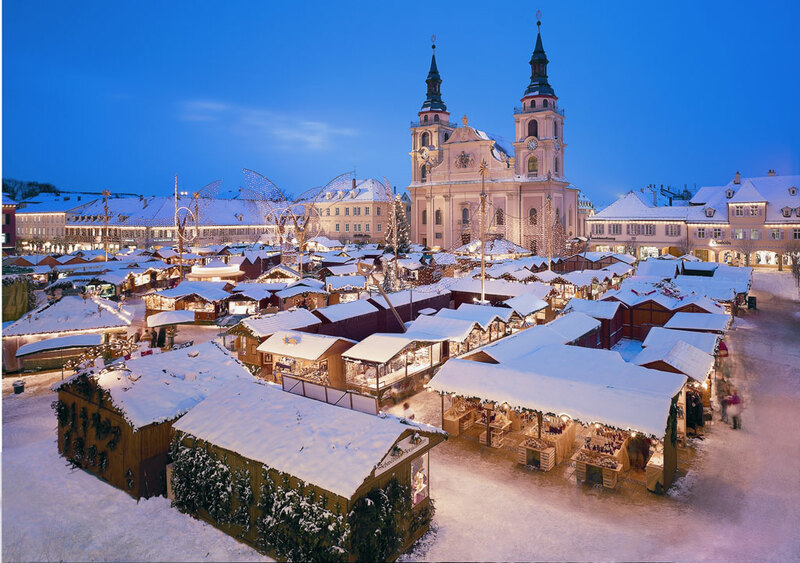 What makes Ludwigsburg Christmas Market so unique and special is its distinctive romantic and historic flavour. Stroll along the spacious passages from booth to booth and enjoy a festive atmosphere and an amazing variety of impressions. Afterwards you might want to warm yourself up again with a traditional hot wine punch. While the young at heart will be attracted by a daily Christmas program, which begins at 7 p.m., the kids will be enthused by a special kiddy program starting at 3 p.m. every day. Bookable upon availibility on weekends from November 22nd until December 21st 2018.